A great looking weekend forecast. What to do is always hard to choose. With wind speeds potentially brisk and nights now very long we decided on 2 good day walks rather than a camping trip. 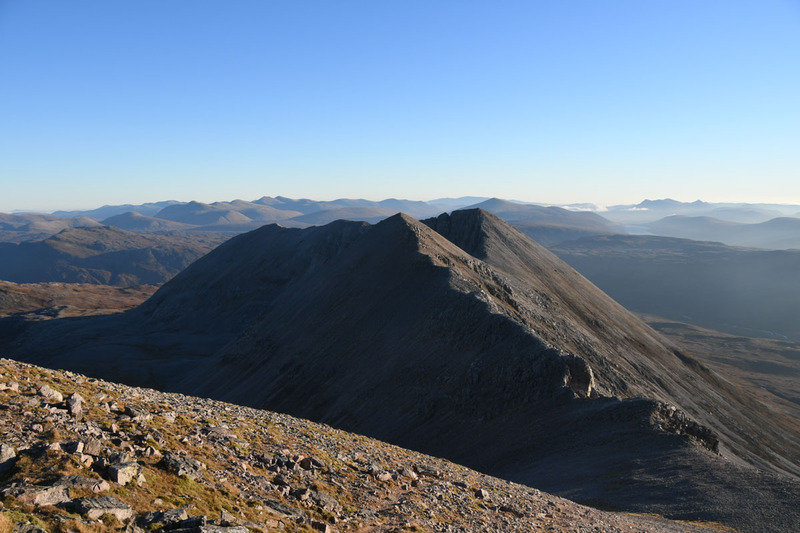 Beinn Eighe had been one of this year’s targets for a decent day and we traversed it in late August only for the weather to fall short of predicted giving a viewless, damp clagfest. A good walk, but not the one we wanted. 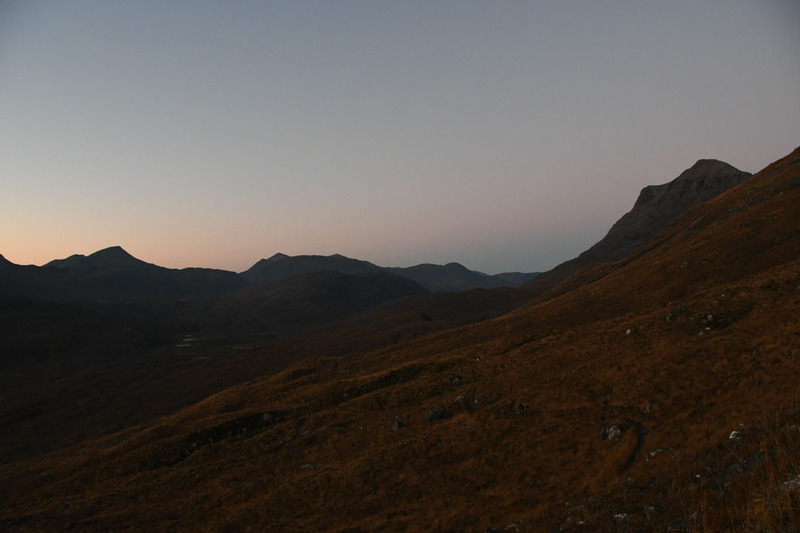 Parked up in the Ling Hut car park at 0640 – it was surprisingly busy for the small hours of a November Saturday. 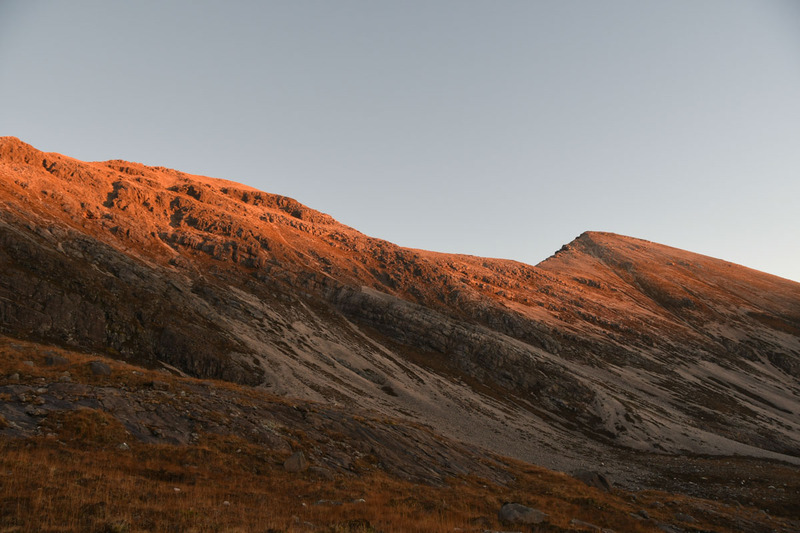 Got walking just before 0700, the predawn light was plenty to cover the 2km east along the tarmac to the Beinn Eighe car park at the foot of the Coire an Laoigh path. Could hear, but not see, redwings passing overhead as we headed uphill. 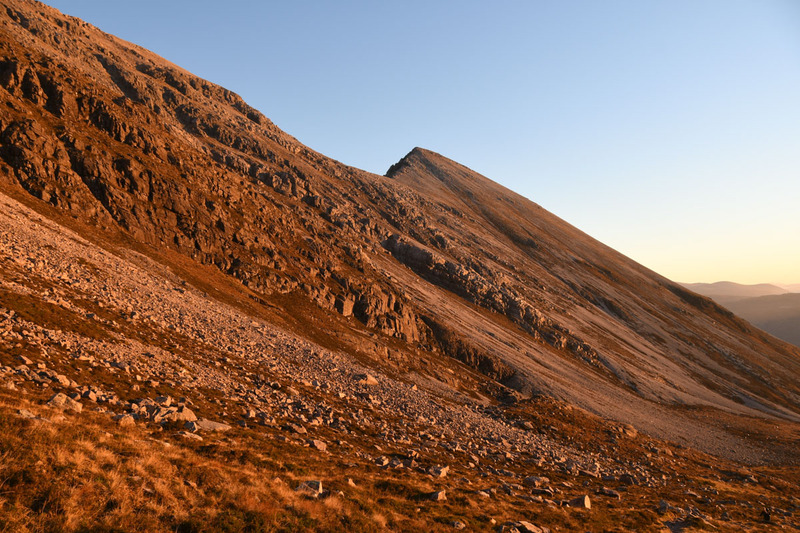 The path up Beinn Eighe is good quality and fast progress is made. To dark adapted eyes the predawn glow gives good views, although it’s less than needed to take handheld photos at non-punitive ISO. 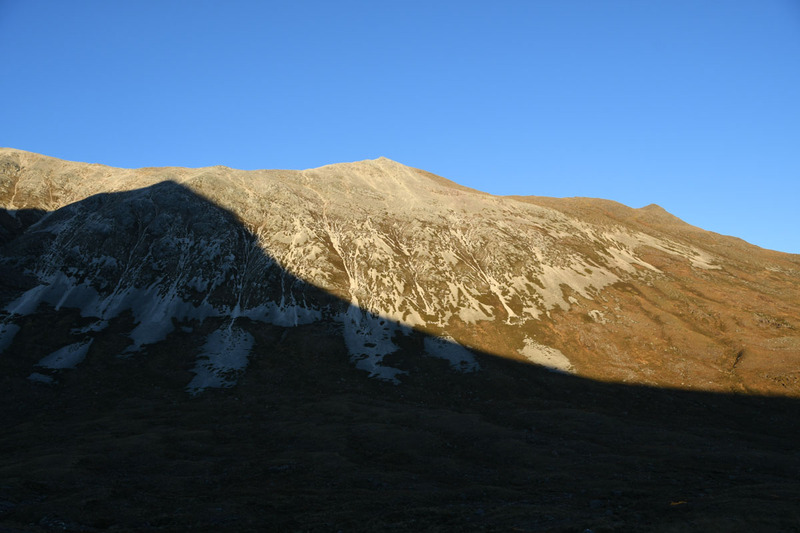 At 810 the sunlight hit the top of Spidean Coire nan Clach and then began to flow down the hill towards us. 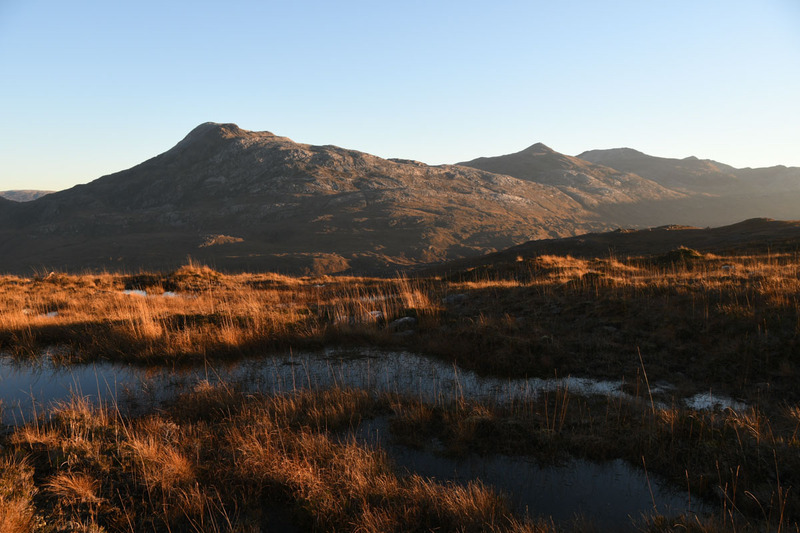 It’s one of the rewards of winter walking out of the dark and up a hill into the light. 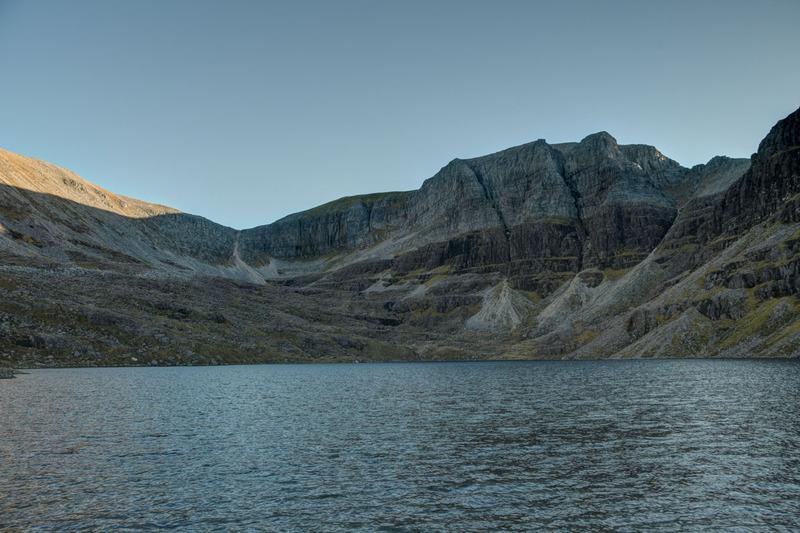 Coire an Laoigh was lit up with syrupy sunlight. 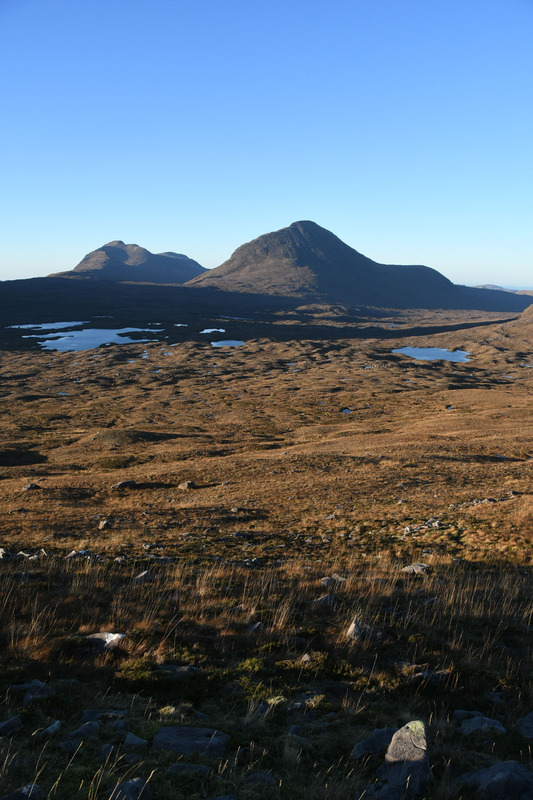 It was also hot – MWIS had predicted 10-14C at elevation and it was already warm in the sun. Having reached the sunshine we throttled back into plod and enjoy gear. 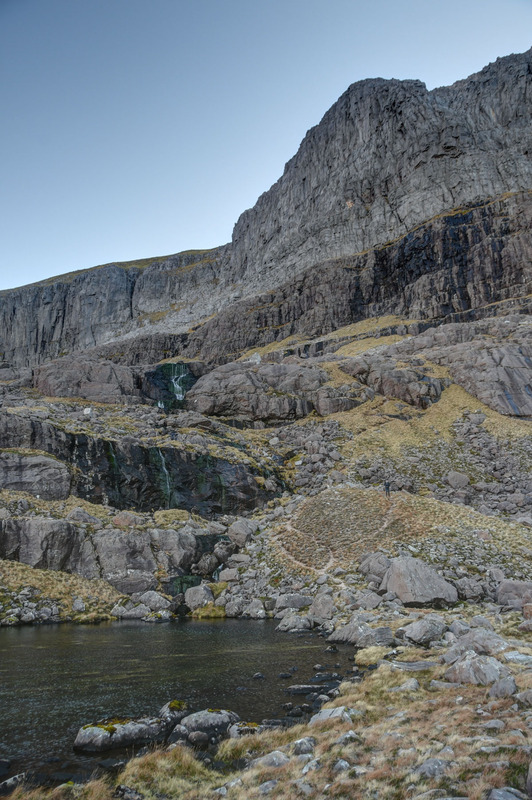 The climb out of Coire an Laoigh is OK, but the path has washed out on the steep coire headwall leaving a steep ascent up the grass. 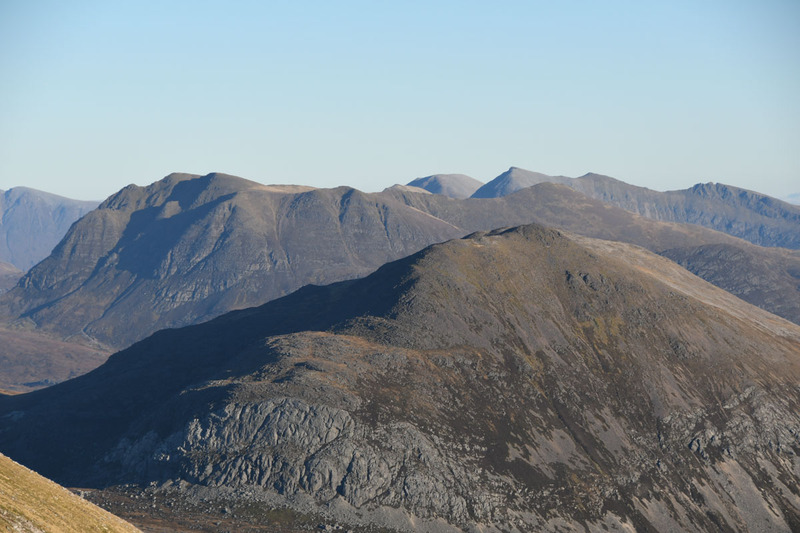 It’s a fairly quick pull up to the ridge out to Stuc Coire an Laoigh. 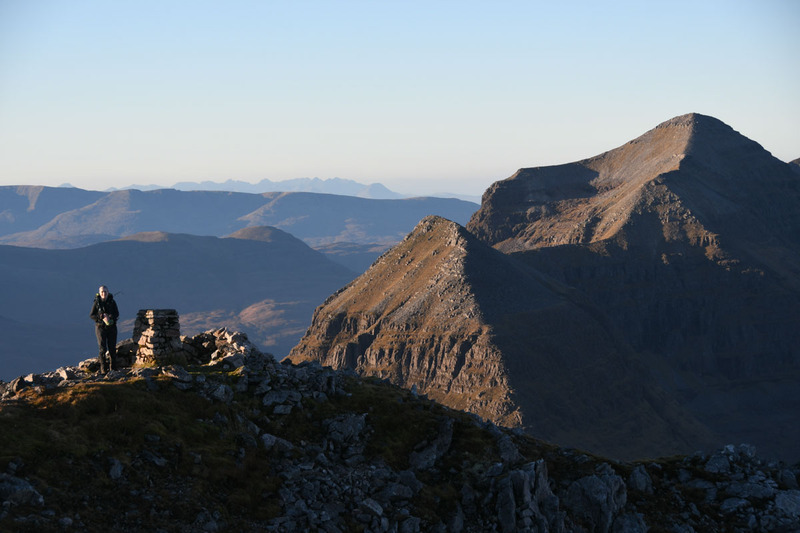 Once on the ridge there’s a view east to Liathach. It was a very good day with pretty decent air clarity. 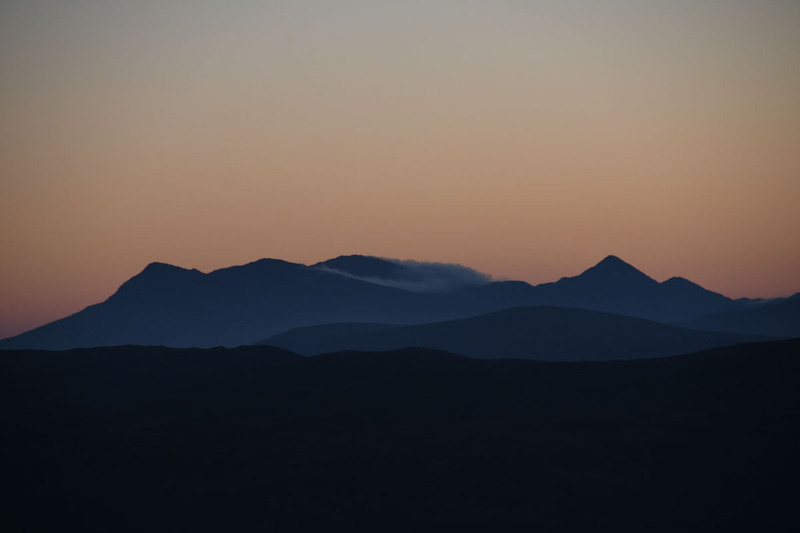 We could see Eigg, bits of Rum, the Cuillin and the Trotternish. Well worth the effort. 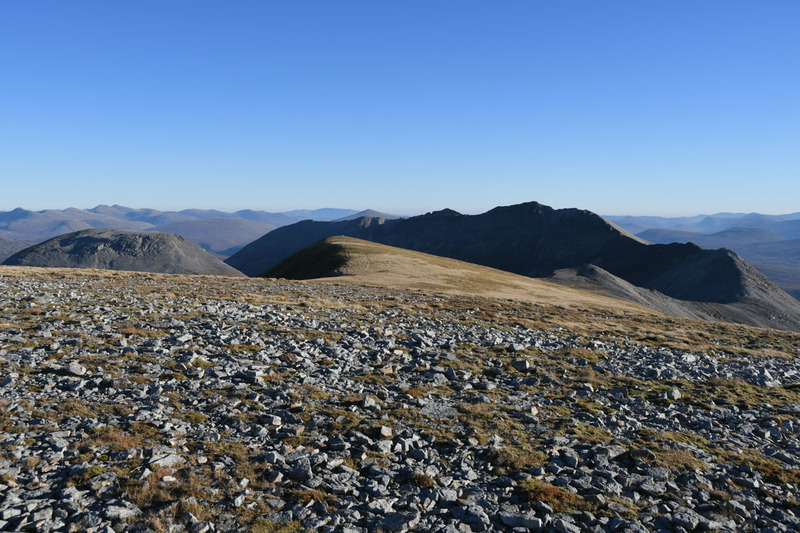 Carried on up to the trig point of Spidean Coire nan Clach and then a quick nip out and back to the summit. The way ahead is pretty benign. 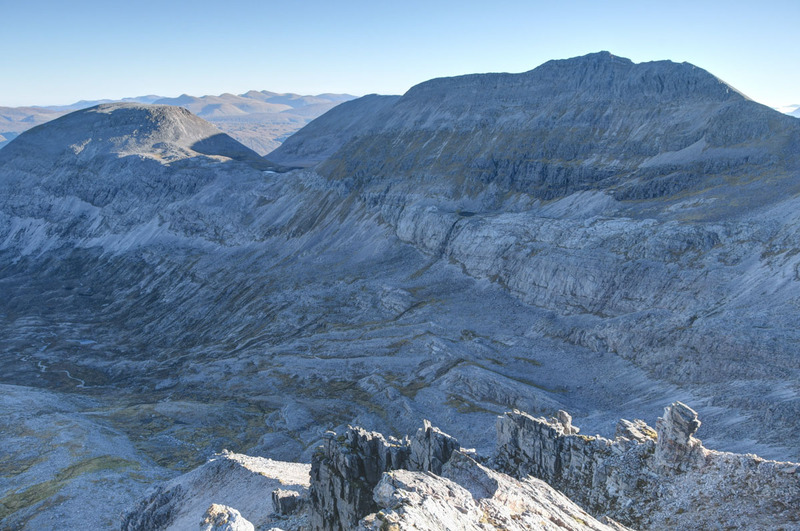 The traverse between the 2 main munros of Beinn Eighe is the least exposed of the 3 big Torridon Munro pairs. 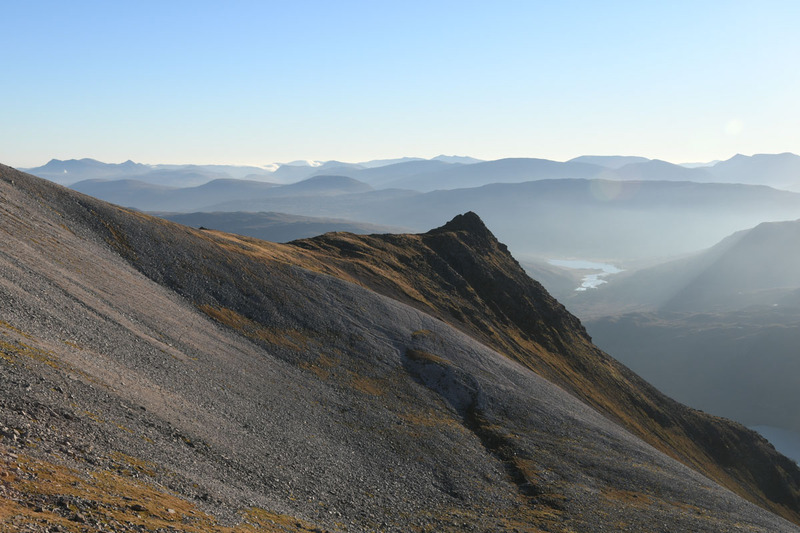 Headed onwards down the ridge – enjoying the views that were nearly completely absent just 9 weeks before. 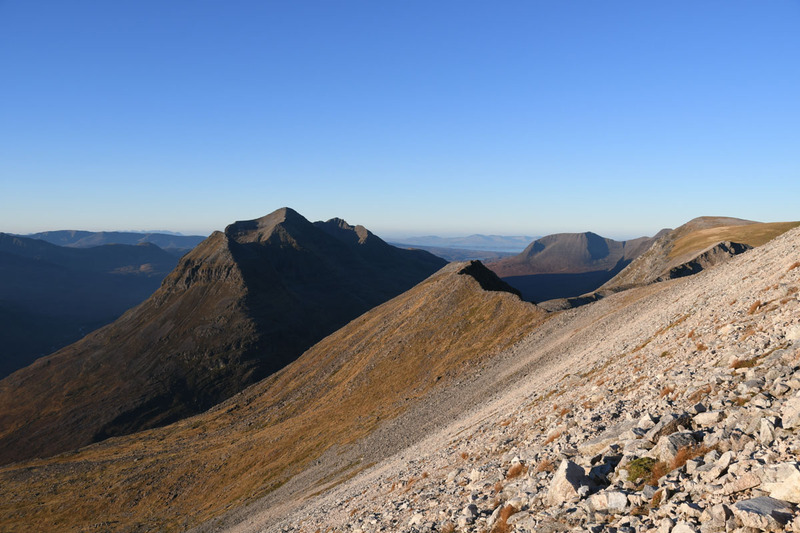 Looking along the north flank of Spidean Coire nan Clach. 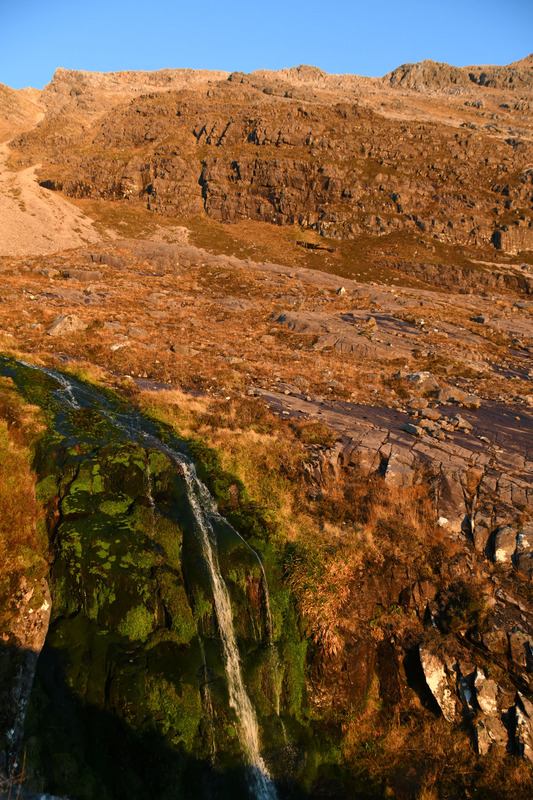 Headed up to Coinneach Mhor – have pondered camping on this lovely mossy top. 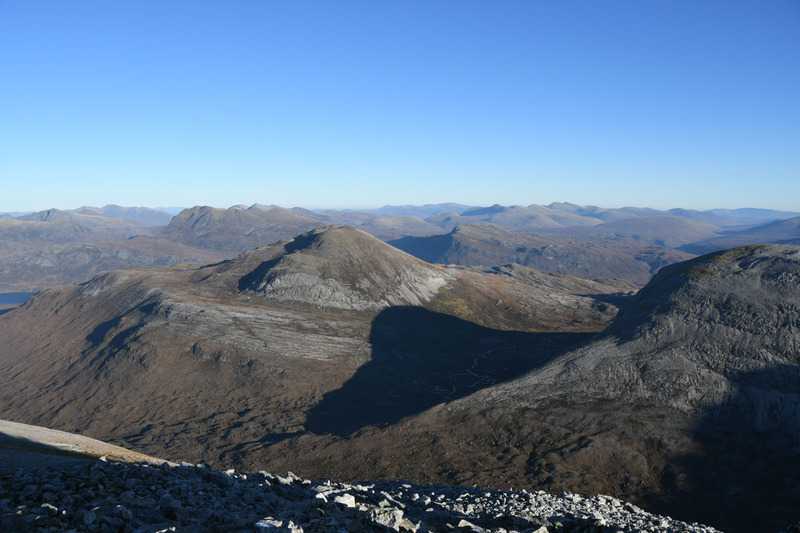 Went out to the summit of Coinneach Mhor, above the Triple Buttress. Stopped here to have some lunch. 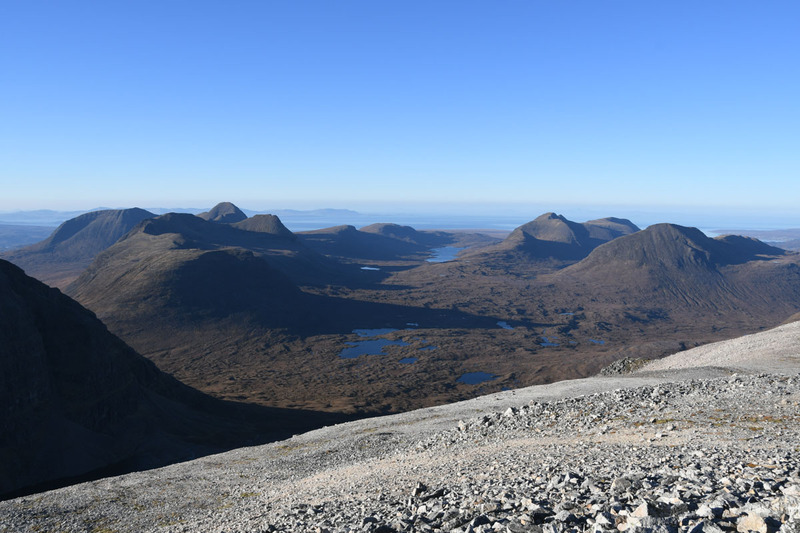 It’s a cracking viewpoint out across Torridon to Skye and beyond. Then headed back to the main traverse route. 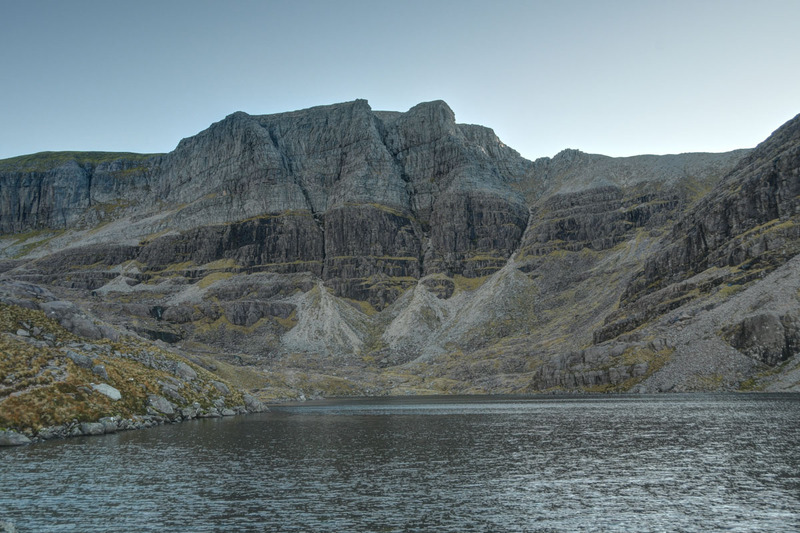 Dropped down to the bealach with Ruadh-stac Mor and then out the arm to the second munro. 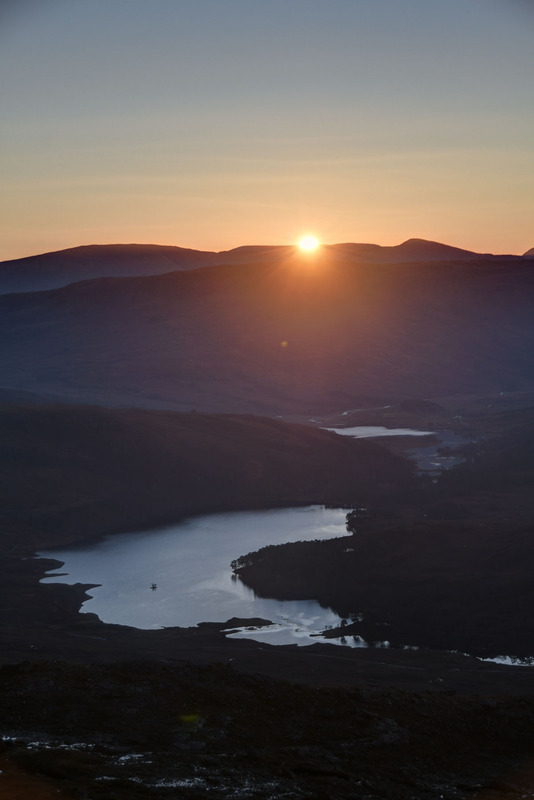 The change of angle brings a good view out over hummocky terrain and Loch a Bhealaich. 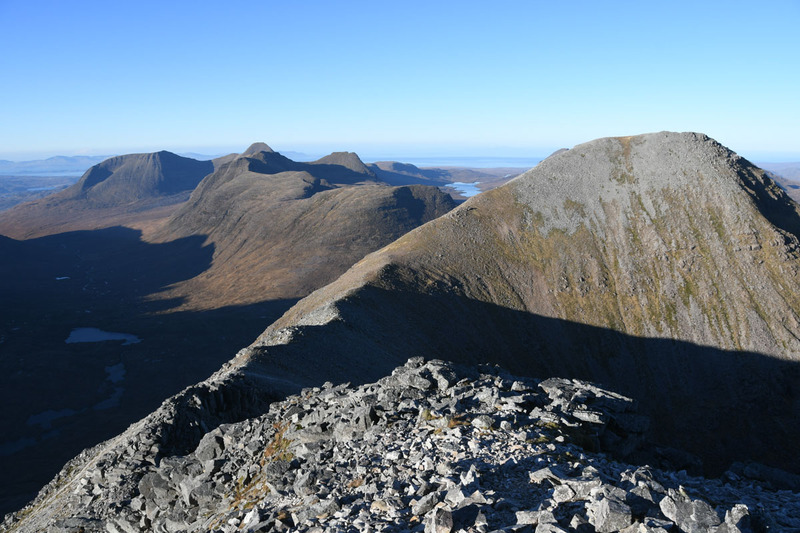 From Ruadh-stac Mor reversed route to the bealach and then dropped down into Coire Mhic Fearchair. As usual the right side of the gulley (in descent) is reasonably solid and allows the descent to be fairly straightforward. 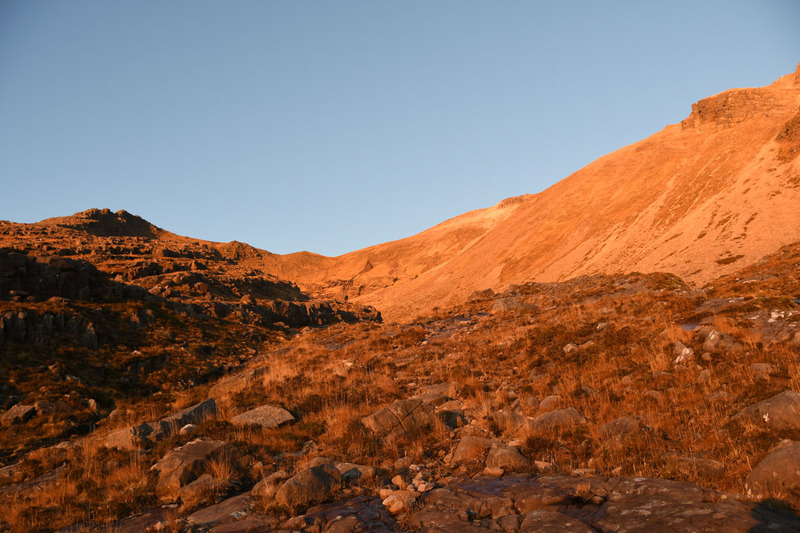 Unfortuately, low winter sun doesn’t get into Coire Mhich Fearchair and so we had lost the lovely sunshine. Still, even without direct sunshine this is a wee gem of a place. Winding our way out of the coire we temporarily got back into some sunlight, the grasses are still standing. 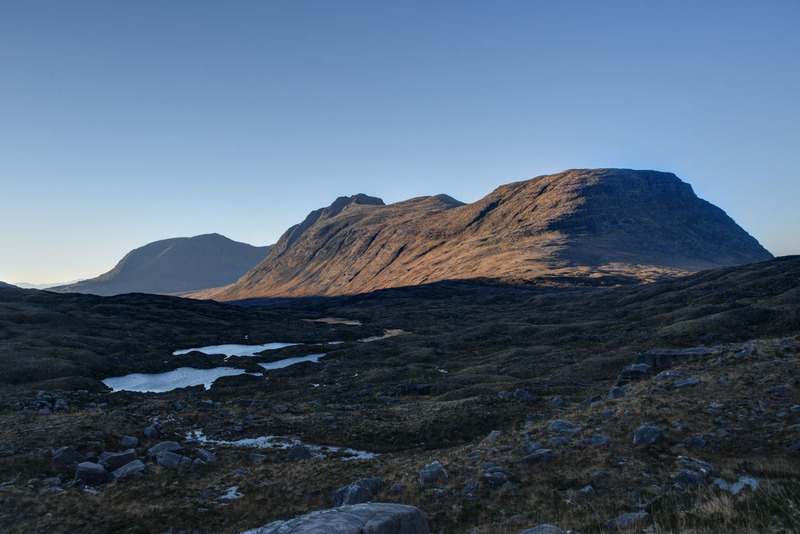 As we turned into Coire Dubh Mor we were shaded by Liathach looking out at the sun on Beinn Dearg. 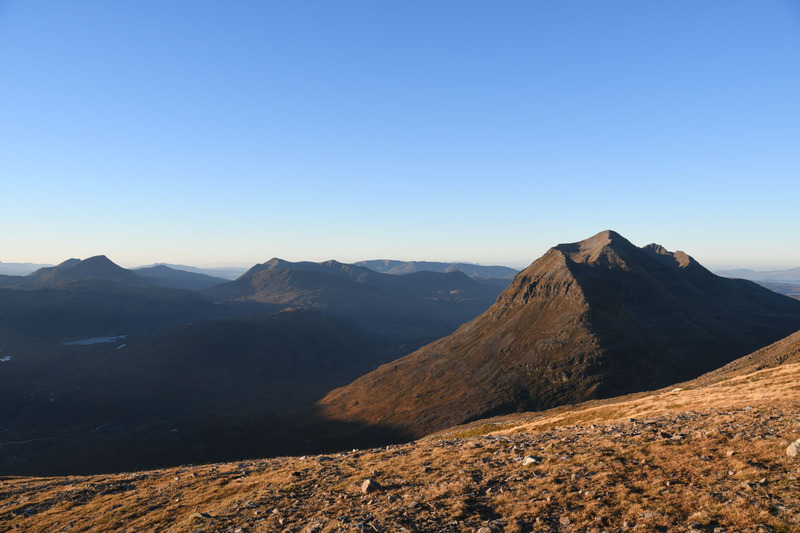 Picked up the pace and yomped back down the track – Stuc a Choire Dhuibh Bhig cast its silhouette on Beinn Eighe. Got round the corner in time to catch one last glimpse of sunshine before dropping into the shaded Glen. 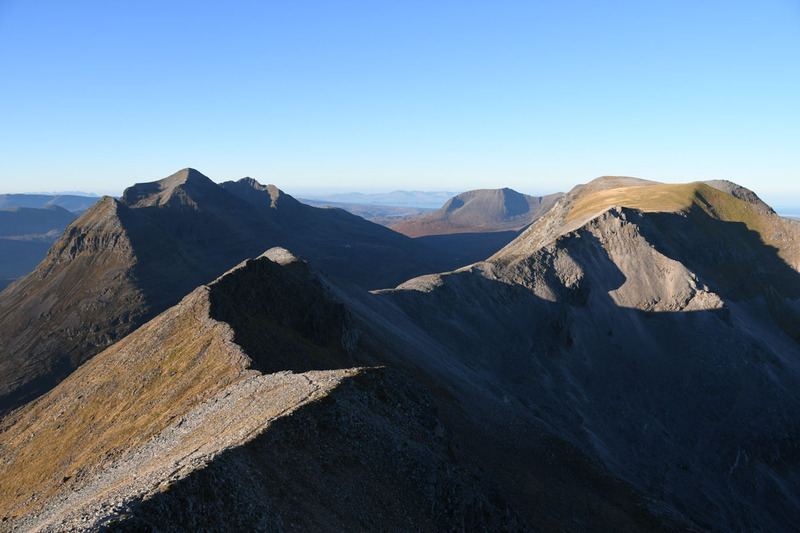 A cracking day, worthy of spending on such an iconic hill. Certainly redeemed our August error. 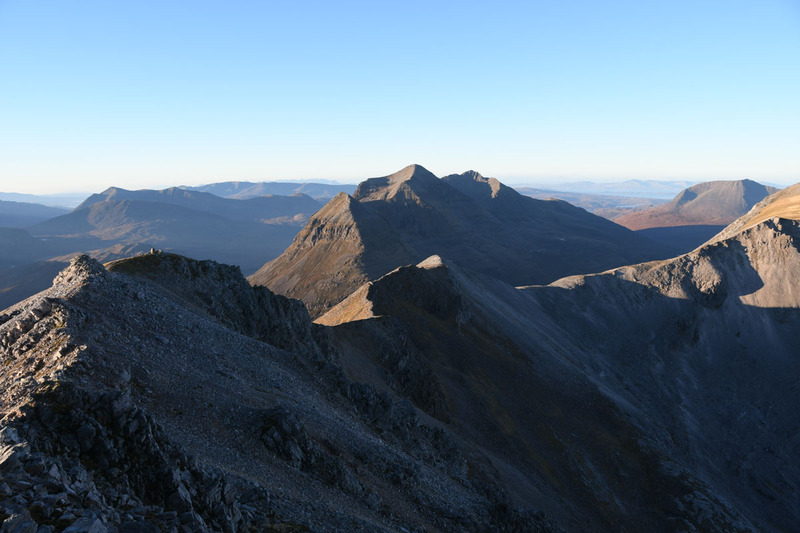 ← The rehabilitation of Sgurr Eilde Mor. 28th October 2018.